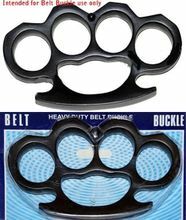 These black belt buckle knuckles are standard size and weigh about 6 oz.each. They come with a stud that can be screwed into a pre-drilled hole to function as a belt buckle. Made of steel they are finished in black matte. Makes a good paperweight, too. Lightweight model (see dropdown menu to choose) weighs almost 4 oz. Note: If you are caught with these concealed in your possession, you may get in trouble with the law. Prohibited and cannot be shipped to:FL, MA, MI, NY, DC, IL, RI or CA.